Before I close out 2017 I want to showcase my senior sessions from this past year. 2017 has been one to remember! I am so thankful to have been trusted by so many seniors to be their senior photographer and couldn't have imagined working with better people! One of my favorite sessions of the year was with Sinead. I was thrilled when I found out Sinead wanted a couple of photos in her prom dress. Once you see the dress below, you'll understand why. Sinead had Sarah Miller do her hair and make-up. Professional hair and make-up make such a difference for senior sessions. Her finished look was stunning! As you see above, we did a lot of tone on tone photos, i.e. the silver dress on a gray background and the white top against the white couch. I love how this little attention to detail draws all the attention to Sinead's face. This is one of the reasons I ask my seniors to send me photos of their outfits so I can pick out the perfect background to compliment their outfits. After finishing up a couple of looks indoors, we headed to downtown Green Bay for a couple more. What had started out as a cloudy day turned into sunshine and added the perfect amount of warm glow to the rest of the session. I loved working with both Sinead and her mom Jacqui. They were both such sweethearts! I have begun booking juniors for next summer and am already halfway booked for the Class of 2019. If you're interested in booking, please contact me soon. I can't wait to see what 2018 brings! This year I'm adding a fashion magazine style option to my senior sessions (think Vanity Fair). The past few months I've studied up on new lighting setups, styling and posing techniques. But before I tried it on an actual senior client, I wanted to test it out. So I contacted Maria, a beautiful dancer I've photographed a number of times for Vibe Dance Center here in Green Bay. Maria is toying with the idea of modeling and when you check out her photos below, you'll quickly see how the camera loves her. For a light and airy look, I had Maria wear a tulle skirt paired with one of her own tops. Hair and make-up was done by Dana Michelle. We also added a bit of air to her hair. I don't think I ever want to shoot long hair again without a fan! It was fun to see how much the mood and feel changes with each location and lighting change! Loved this black on black set! Next, we played a little "simon says" of modeling and had fun with a ton of different looks. Maria's a natural. For the last look, Maria wore some of her own clothes that had an edgier feel, so I lit it with some edgier lights. What a contrast to her first set! This is a perfect add-on for a senior session (on location + studio)! Contact me to set up your session! I first met Kelsey when she was opening VIBE Dance Center roughly 3 years ago. We've worked together on head shots, studio shots and yearly photos of her various dance classes and competition teams. It's been so much fun to see her business grow. Kelsey is a beautiful and kind young woman and I am so happy for her success. Next week Kelsey and her long-time (11 years!) boyfriend, now fiance, Jesse are traveling to Mexico to get married! 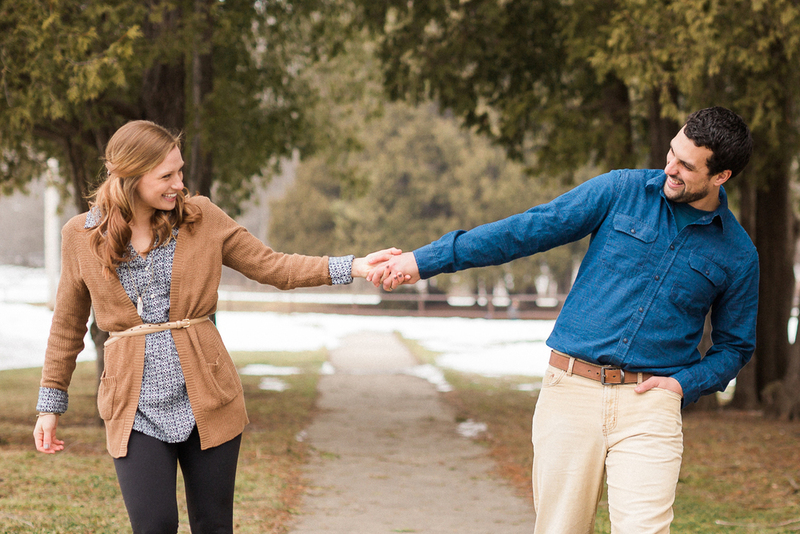 Last week, we did a quick engagement session for Kelsey and Jesse. One of the reasons it was quick was because it was FREEZING outside. The other reason is this cute couple is super easy to take photos of! Last week, my good friend and shooting partner, Mary Santaga of Mary Santaga Photography had the time of our lives at an amazing workshop called Walk Through a Wedding. Just as the title of the workshop implies, we got the chance to learn about shooting every aspect of a wedding day. The workshop was put on by the super talented husband and wife team Justin and Mary Marantz of Justin and Mary Weddings. Mary and I are dipping our toes into wedding photography (we work as a team) and this workshop ignited the fire in both of us! Here's just a sampling of bridal portraits I captured on the first day.